For our PFP services, we supply and apply the material for piping, vessels, equipment, bulkheads and structure. For items requiring maintenance, we can provide removable PFP casting for items such as valves and flanges. The protection rating provided is determined by the thickness of the PFP application, plus the thickness and type of material it is covering. The PFP thickness is also determined by the fire protection rating requirements of the client. Protection up to F120/H120 can be provided, by both our wet application and casting type PFP systems. The pictures show the castings fabrication process and some items fitted to the vessel nozzles and main SDVs for the Nippon Oil Helang platform and the Talisman Bunga Raya platform, which we recently completed. The early pictures show the fabrication and fitting of the Talisman SDV, PFP coated metal cast covers. The later pictures show the process for the FULL PFP type castings for the Helang project. Both types of castings are individually designed after site stringing, to determine size and shape requirements needed to fit local situation. When practical, foam cut-outs are used first as trial fit items for the FULL PFP castings before making the castings. The FULL PFP type castings are reinforced with steel at the mid DFT thickness point, which extends all the way into the flanges. The Talisman SDV valve and actuator system prepped for wet application. The actuator spring end after wet application. The valve body after wet application. Note, the nameplate and data plate have been left uncovered. They were later covered by removable PFP access panels. The actuator end during wet application. A selection of the PFP covered metal box castings during fabrication. Some nut covers in the foreground, and the spacer bottom flange cover sections in the background. The completed Talisman SDV. The wet application and all but the flange castings are completed. 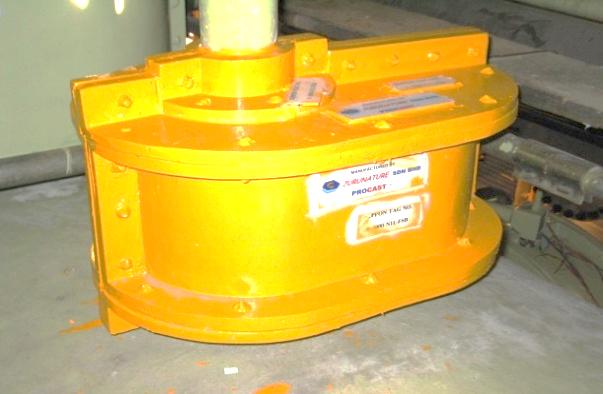 The flange covers were to be fitted offshore, after installation of the valve (which we later did). The Nippon Oil Helang Platform during construction at MSE. A foam cut-out for trial fitting to a flange. The trial fit foam cut-outs for the SDV actuator center section. The items have a PU coat applied to maintain form. The items shown here assembled in the factory prior to taking to site for trial fit. The trial fit of the SDV center section at site. Trial fit of the Position Indicator cut-out, on top of the actuator center section. A PU coated foam mould prepared and ready for casting. The castings being removed from their moulds. A completed valve casting, fitted, sealed and painted. A valve casting sealed to the quick release connector’s flange, to allow uninterrupted access to the quick release connector. A pair of flange castings. The rear casting is fitted over a flange with spectacle blind. A 24” Manway cover fitted with the removable PFP casting. The completed 36” Main SDV, installed and fitted with its PFP castings and wet applied PFP. The PFP material is easily covered by many types and colours of paint, so that the client’s colour scheme can be maintained. The pictures also show that the castings, due to their individual design, fit the required items well, without causing any interruption to their normal operation. As the castings are fully removable, and reusable, maintenance and inspection of the items can be carried out with little inconvenience. 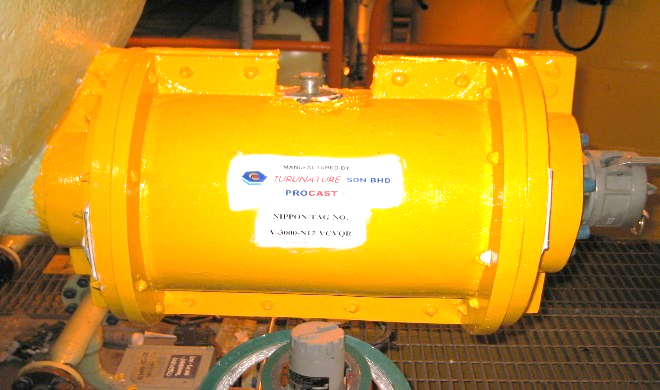 Where wet application is used, PFP cast access boxes can be fitted to pipes, vessel body and other structure, to allow inspection for under insulation corrosion etc. The PFP material also provides insulation and blast-proofing properties.